Danny added: “I actually played with Amit when I was younger. Kamal is a great role model and his passion for cricket matches mine. Being here reminds me of Amit.” But as the media manager also went on to say: “cricket specifically as a game has allowed me to recognise losing is as much a part of life and personal development as the winning and the highs.” Indeed, always lauded as the Gentleman’s Game, the sport is known for its more balanced, regulated and focussed approach. “Where other sports such as football might invite aggression as commonplace with normalised fouls and so on,” Kamal said, “cricket very much asks the individual and the bat and ball do the performing.” It is at once self-reflective and a team effort. This extends to Ganador’s – the name meaning winner and by the brand’s extension, a particularly open-minded sort - inclusive social ethic. As well as producing affordable equipment, Kamal also actively works to recruit more women, and varying cultural backgrounds into the game: “we are very proud of our brand ambassador, Saba Nasim: a great woman who has helped many girls from different upbringings realise their potential. We are also involved with Capital Kids Cricket, who go into schools to deliver a program set out by the ECB to encourage greater participation from inner city youngsters in the game. We are also very proud of our association with the Essex County Cricket Club Multi-faith cricket tour to the Vatican.” In September 2017, Ganador sponsored a Multi-faith team to play against a team based in the Vatican City - and we very much look forward to welcoming them on their return trip to the UK in June/July this year. “It’s been an incredible journey and we are only getting bigger,” Kamal said. “We’ve had great praise and support from incredible cricketers such as Gareth Batty too. We’ve also had positive responses from professional teams, such as Surrey, who have come into the office to try the equipment and were voted number one for our bats on the merchandise site: ‘It’s Just Cricket’. Thus, just as much a social experience as an enterprise, the Ganador Squad not only put the heart into good business but capture the very essence of their sport as they do it. “We represent grass-roots cricket and accessibility for all,” Danny aptly concluded. “We wanted to be fair and include everyone. That’s initially why we expanded out into miscellaneous products: a good plastic set, say, could be a child’s introduction to the game.” Through its literal equivalent, Ganador show how genuine devotion can propel you in the proverbial professional field. 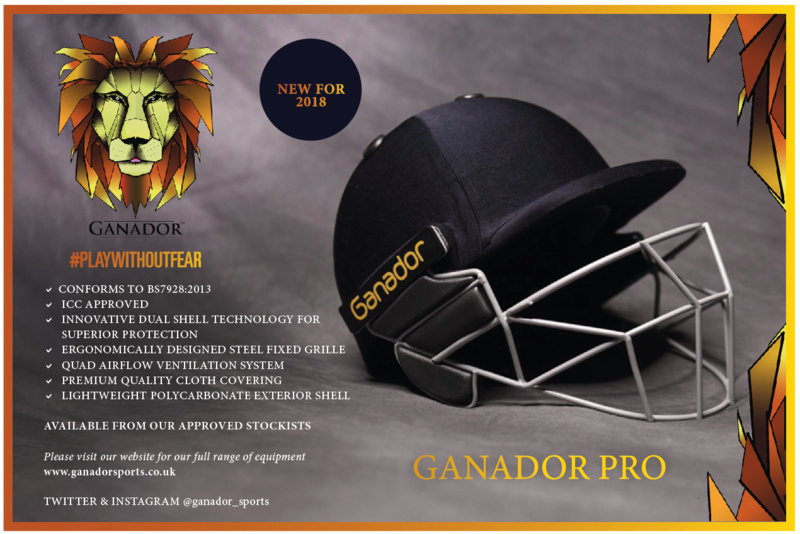 How exactly does the Ganador Helmet incorporate safety? Designs are developed so they perform to the impact protection standard. The technology involved is double-shelf. 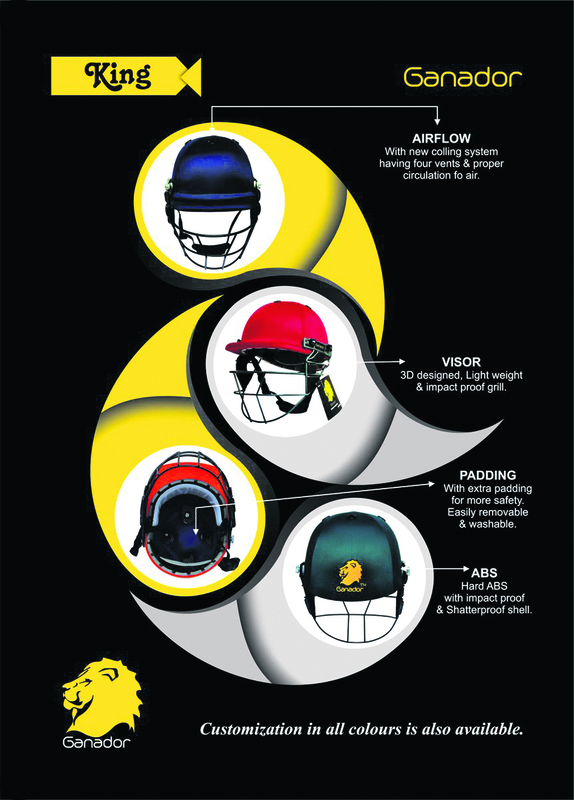 There are two layers of protection: the polycarbonate plastic shell of the helmet and the second, interior layer of protection, covered by cloth, is a more rigid material. It’s moulded to the interior of the exterior of the product. You want to be protected against what is essentially a missile that could be coming at you at anything up to 90 miles per hour. What have been some of your proudest moments with your star equipment? Punam Raut, an Indian Women international cricketer, wore our helmet while scoring a century in the 2017 Women's World Cup against Australia. It’s also been great to have cricketers who play the game come back to us so impressed with the quality of our merchandise. Finally, it’s good to be getting more people from European countries to play the game. It’s already quite big in Asia. Name another ambassador for Ganador? Ryan Karuna. He’s the fifteen-year old captain of Essex Under 15s. He was another obvious choice for us as he is a talented young person with a bright future. Finally, Danny as a media manager, was there a specific trick to boosting traffic on the site? It’s quite simple if you’ve the vision in mind: have good spelling and grammar; make sure the general layout of the website is appealing and clean e.g. example easy accessibility to the homepage.